The Texas Lottery, operated by the Texas Lottery Commission, is the government’s official lottery for the state of Texas. It sold its first ever ticket way back in 1992. Today, the Texas Lottery not only provides players with the chance to win millions, but also raises funds for Texas state programs and other good causes. Over $28 billion in revenue has been contributed to programs that support Texas education and veterans. You can purchase your Texas Lottery tickets from any licensed retailer within the state of Texas. Winning tickets are valid for 180 days from the date of the drawing. Can I buy TX Lottery tickets online? No. Texas laws and regulations do not permit the sale of Texas Lottery tickets over the internet. Lotto Texas is Texas Lottery’s original jackpot game. The rules are simple: Just pick 6 numbers from 54, and match as many as you can. Match all 6 and win the jackpot, which typically reaches multimillion dollar levels. Drawings are on Wednesdays and Saturdays at 10:12 PM Central Time. The Texas Two Step is easy and fun to play. 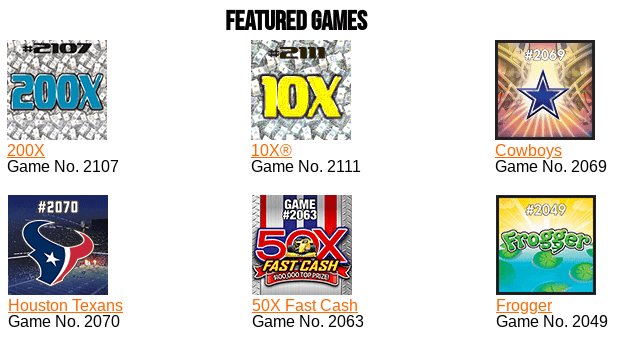 Pick 4 numbers and an extra bonus ball, and try your luck at the $200,000 rolling jackpot. Drawings are on Mondays and Thursdays at 10:12 PM Central Time. In All or Nothing, players can win up to $250,000 by matching all 12 numbers from a pool of 24. You can also win the same prize if you match none of the numbers. Smaller prizes ranging from $2 to $500 are also up for grabs. Drawings are held 4 times a day, 6 days a week. The Texas Lottery’s Pick 3 game lets players pick 3 single-digit numbers from 0 to 9. Winners can take home the top prize of $500 by matching all 3 numbers. Drawings are held 4 times a day, from Mondays to Saturdays. One of the more complicated games offered by the Texas Lottery, Daily 4 involves picking 4 single-digit numbers from 0 to 9. Numbers picked may be repeated, and the odds of winning are determined by a player’s chosen combination. Players also have the option to pick how they play – whether by matching the numbers in the same order as the draw, or in any order they appear – potentially winning up to $5000. Draws are held 4 times a day, from Mondays to Saturdays. Take home up to $25,000 cash if you match 5 of 5 numbers in Texas Lottery’s Cash Five game. All you have to do is choose your combination from a pool of 35 numbers. Drawings take place from Mondays to Saturdays at precisely 10:12 PM Central Time. Of all Texas Lottery winners throughout history, however, perhaps the most famous one is Joan R. Ginther. Often dubbed the luckiest woman in the world, Ginther won four multi-million jackpots between 1993 and 2010. She took home over $20 million, total. The Texas Lottery offers a wide range of scratch-off games to choose from. Scratch-off ticket prices range from $1 to all the way up to $50. Jackpots range from $500 to $5M. Texas Lottery Second Chances – What is Second Chance? Second chance drawings offer exactly that – a second chance at winning. Second chance winners won’t be eligible for the same prizes as the original draw’s, but in Texas Lottery’s case, second chance prizes can reach up to a cool $5 million. How does Second Chance work for the TX Lottery? Second chance draws are very easy to join for the Texas Lottery. Simply log in to the Texas Lottery Luck Zone from their official website and register an account. After which, you’ll be able to enter your non-winning scratch tickets and qualify for a chance to win some awesome prizes. The Texas Lottery is headquartered in 611 E. 6th Street, Austin, Texas 78701. The Texas Lottery App is available for download for all iOS and Android mobile devices. While you can’t purchase tickets with the app, you can still enjoy a number of useful features especially if you’re a regular player. Scan your ticket bar codes to see if you’ve won. Save your lucky numbers for future play. View the winning draws for all of Texas Lottery’s draw games. Find the nearest Texas Lottery ticket retailers. Want to find out what the current Texas Lottery winning numbers are? You can visit Lottery USA for more up-to-date information on the latest Texas Lottery results. There you’ll find news on all Texas Lottery draw games – including winning draws, jackpot size, next drawing dates, and more.